George Graham Reviews Leftover Salom's "The Nashville Sessions"
Bluegrass seems to be having one of its periodic revivals of popularity, especially among younger music fans. Every so often, rock performers will start collaborating with bluegrass musicians, as did for example, Jerry Garcia back in the early 1970s, and will bring some of their fans along. This time, it's a general trend of so-called "roots rock" or "Americana" among the alternative rock generation that seems to be the driving force. Rockers like Steve Earle and even Phish have been associating with bluegrass musicians, and banjo virtuoso Béla Fleck has experienced surprising popularity with his Flecktones electric band, and recently Fleck released an album of bluegrass to considerable acclaim. This week, we have an interesting release by a Colorado band called Leftover Salmon. The CD is a kind of all-star bluegrass collaboration and it's called The Nashville Sessions. Leftover Salmon is based in Boulder, Colorado and released their first album in 1993. Their credo of eclecticism is illustrated by how they describe their music: "Polyethnic Cajun Slamgrass." They share some stylistic influence with another excellent Colorado band String Cheese Incident. In recent years, there has developed a distinctive and quite eclectic Rocky Mountain bluegrass scene, with the annual Telluride Bluegrass festival no doubt being a strong catalyst. Bands like String Cheese Incident and Leftover Salmon have been electrifying the bluegrass influence and getting jazzy, rocky and mixing in other genres, while also showing some first-rate musicianship, getting into extended instrumental jams in performance and generally having a good time. They have been touring extensively, and gaining ever more fans as they expand their geographical range. 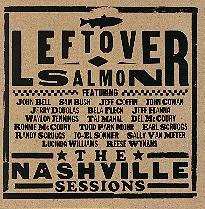 For this third CD, the Leftover Salmon journeyed to Nashville to have Randy Scruggs, son of the legendary banjoist Earl Scruggs, serve as their producer. While there, they enlisted the services of a remarkable number of notable guest musicians, including Béla Fleck, and his bandmate in the Flecktones, saxophonist Jeff Coffin, plus Fleck's former bandmates in New Grass Revival, Sam Bush and John Cowan, along with bluegrass legends Del McCoury and Earl Scruggs, country singer Waylon Jennings, and even blues singer Taj Mahal. Also appearing are singer-songwriter Lucinda Williams, Blues Traveler harmonica man John Popper, Dobro virtuoso Jerry Douglas, and former Stevie Ray Vaughan keyboard man Reese Wynans. The result is an enjoyable album with a good-time aura, on which the main influence is bluegrass, but the music runs rather far and wide to Southern-style rock, a bit of blues, some Cajun, and country. The material consists mostly of original songs by the band, but some of the tracks were written by the CD's guests, including songs by Taj Mahal, Waylon Jennings and Lucinda Williams. Leftover Salmon itself is a quintet consisting of banjo and Dobro player mark Vann, guitarist and vocalist Vince Herman, bassist Tye North, who is the son of Roger North of the Holy Modal Rounders, mandolinist and vocalist Drew Emmitt, and drummer Jeff Sipe, who spent a while as a member of Bruce Hampton's Aquarium Rescue Unit band. All are first-rate musicians, but they do tend to be eclipsed a bit by all the notable guest stars. There is a lot of material on the CD, 12 pieces in all, and that does not give them much of a chance to stretch out instrumentally on each track, despite the nearly full-hour playing time on the CD. There are only two tracks that exceed six minutes, and neither gets very much into an instrumental jam. Leftover Salmon's The Nashville Sessions is fun album of bluegrass, rock and other stylistic ingredients marked by an impressive roster of guest musicians. This Colorado-based band shows great musicianship, respectable songwriting and the ability to create a good-natured mood on their recording. But there are so many significant guests that the band does tend to get lost, and with Leftover Salmon not being that well-known outside of their home territory, it may seem like an unequal match. And though there is excellent musicianship all around, the underlying material is not terribly profound either musically or lyrically, so I felt that there were some possible missed opportunities to take better advantage of the guests. But at the same time, the spirit of the music is hard to resist, and Randy Scruggs' production is first-rate. We'll also give this CD good grades in terms of sound quality. The acoustic instruments generally sound convincing, the vocal harmony blends are very nice and the dynamic range, though not stellar, is respectable for CD released on a large pop label. With bluegrass making something of a return to the public consciousness, Leftover Salmon's The Nashville Sessions will likely find a receptive audience among rock fans just discovering bluegrass, and among open-minded bluegrass fans looking for an upbeat album that's notable for the wide range of well-known musical guests, and which puts those guests into interesting musical settings. (c) Copyright 1999 George D. Graham. All rights reseved.